You have to feel a little bad for Texas Gov. Rick Perry. He came all the way to California this week to “poach jobs” and left empty-handed. Maybe Perry hasn’t read the studies that show very few jobs move from California to other states. Or maybe he wasn’t aware that California is on the rebound in a big way, now leading the nation in job creation. At the end of the day, Perry’s trip really was all hat, no cattle. Over the last week, there’s been a lot of silly media coverage comparing Texas to California. It’s almost like a sports rivalry at this point. Perry says his low-regulation, low-government service, low-wage economic model is the way to go. As a native Texan, I know better. I still remember going to the beach in Galveston and having to use turpentine to clean my feet before I left because of the oil. And I know being a worker in Texas is no joy, either. Workers have few rights. Collective bargaining is rare. If you’re injured on the job, tough luck. Texas is dead last in workers’ compensation coverage. Health insurance is hard to come by. Wages are low, and as a result, poverty is high. 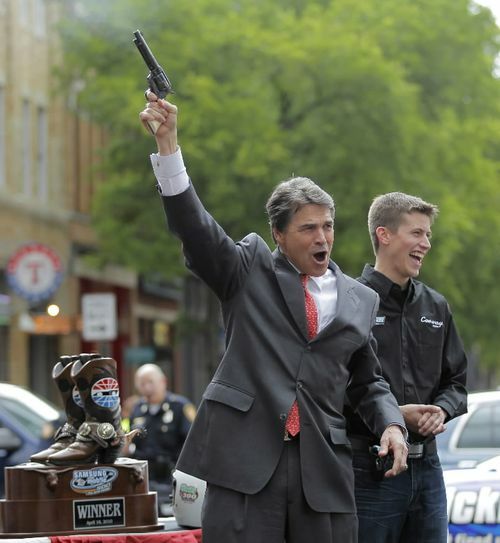 The Rick Perry fairy tale of Texas being an oasis is nothing more than a Texas-sized lie. But we think Rick Perry ought to come back. Yep, you read that correctly. We should invite Perry back to California with open arms. To talk about the one thing (ok, counting the Austin music scene, maybe two things) that Texas is doing right. When it comes to corporate tax break accountability, the Rick Perry-created Texas Enterprise Fund has California beat, hands down. In Texas, corporate subsidies are transparent. The public actually knows which companies are getting it. In Texas, the companies are actually required to create new jobs in order to get a public subsidy. In Texas, the subsidies are attached to wage standards, and companies can’t get public assistance unless they create new and good jobs. And, in Texas, companies must give the tax credit money back if they don’t meet job creation goals. California, on the other hand, requires none of this transparency or accountability from our own subsidy programs, which is why we cannot gauge whether our package of corporate tax giveaways is effective. California’s Enterprise Zone program is the poster child for wasteful corporate tax breaks. The program is costing the state $700 million a year without creating the necessary jobs to give our taxpayers a return on their investment. In fact, studies have documented that the EZ program is simply paying for the cannibalization of jobs from one region of California to another. The program is in desperate need of serious reform. We can’t keep lining the pockets of CEOs with taxpayer funds that should be going towards investing in our future. That’s a concept that even Rick Perry seems to understand. So I’d like to extend an invitation to Rick Perry to come back to California. Not on another phony “job-poaching” mission, but to talk to our state legislators about the transparency and accountability built into Texas’ subsidy programs. That seems like a worthy cause. And given that a majority of Texans now disapprove of Perry’s job performance, another trip out of state might not be such a bad idea. Brown were telling: “He just doesn’t get it”. Ummmmm……maybe you read a different story than I did, but I do believe that Ms. Wei’s point was to say that California SHOULD follow Texas’ example–at least in part–when it comes to enterprise zones. In fact, she states pretty clearly that it’s the ONE area that Texas has it right, particularly in comparison to California, and that California should more closely emulate Texas’ enterprise zones. Not sure what your beef is here, Jacob. She pretty clearly supports enterprise zones, just not in the form California currently employs them. program when he was Mayor of Oakland. So what don’t you get?